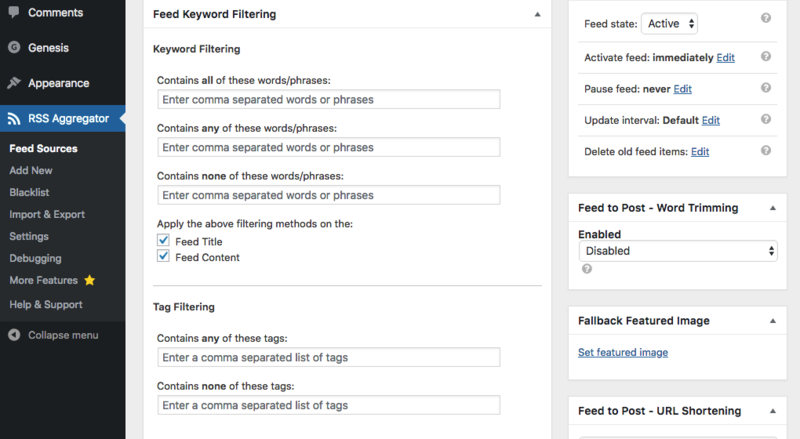 In order to understand how the keyword and tag filtering works we’ve set up this page that explains each step that the plugin takes in order to filter out the content based on your settings. Combine the keywords from the individual feed sources with the ones in the general settings. (all 3 kinds: all, any, none). Take the “all” keywords, and check the content and title for each one. If one is not found in either field, the item is rejected; otherwise, continue. Take the “any” keywords, and check the content and title for each one. If none are found in either field, the item is rejected; otherwise, continue. Take the “not” keywords, and check the content and title for each one. If one is found in either field, the item is rejected; otherwise, continue. Let’s say you have a feed item with the content “The quick brown fox jumped over a lazy dog”, and with tags “test” and “example”. In conclusion, all the filtering keywords and tags you enter into the settings must be true in order for the feed item to be imported. So if you set keywords and tags, both must be true for the import to be successful.